Ever wonder why you should use a grip product for diving? The main reason is safety! Smart athletes use Getta Gripp waterproof hand grip. Safety is the buzz word circulating around all sports, especially diving. Whether its concussions, torn ACL’s, or broken bones- SAFETY is a HUGE CONCERN! 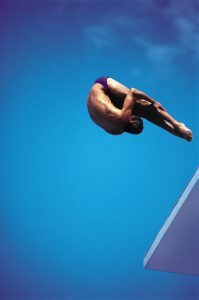 Being a diver at the collegiate level, my teammates and I would constantly push the limits striving to learn the most difficult dives. To ensure that we did them safely, we were constantly looking for a grip product for diving to give us that extra bit of grip security. Needless to say, myself along with my teammate Matt Vieke, and our mad scientist Chris Livesey, we were able to create a grip product for diving to ensure that extra bit of security and we named it-Getta Gripp! So again why use Getta Gripp? Because nobody likes bellyflopping. So prevent the risk of injuries in your sport and Getta Gripp!